IPython is an enhanced Python shell, the shell being the prompt which appears when you start python command in your terminal. IPython comes with notebook flavour, where IPython Notebook presents the modern HTML-based shell for Python. Python is so-called dynamic programming language where much can be achieved by piloting your code in an interactive interpreter or tuning your production server from the shell. Basing the read-evaluate-print-loop (REPL) to web browser technology, instead of terminal technology, brings shell usability to the modern age, boosting your working efficiency considerably. IPython notebook, as being based on HTML, can also output graphics and dynamic clickable and navigable graphics. For graphics, diagrams and plotting, check out Bokeh and Pandas libraries. First create a virtualenv. Then continue in the activated virtualenv. This will start IPython kernel running in the port localhost:8888 and automatically connects your default web browser into it. 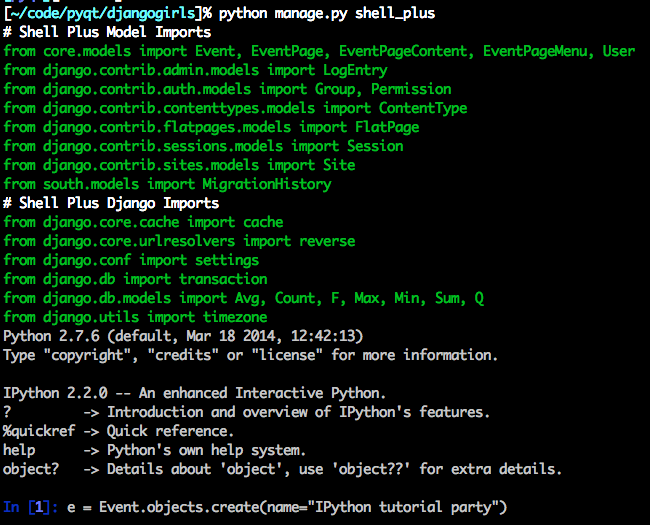 Install Django Extensions package. Django Extensions, with many other features, gives you the ability to automatically import all of your application models on the start up to have quicker access to them. We do the example below using DjangoGirls website checkout. IPython Notebook uses, by default, uses localhost TCP/IP sockets to allow web browsers to connect to IPython Notebook kernel. If you want to run IPython Notebook on a non-local computer you can use SSH tunnels. Please first read SSH basics for developers, then proceed to how to build SSH tunnels for port forwarding.